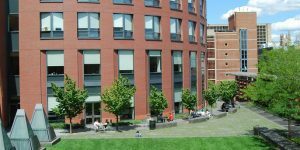 The UPenn Wharton School Executive MBA program takes place over two years, and convenes every other Friday and Saturday at one of the school’s two campuses – Philadelphia or San Francisco. In addition to the alternate Fridays and Saturdays on campus, EMBA students are expected to attend an additional five extended sessions as well as participate in a week-long Global Experience. Classes are held over three terms per year. Students are expected to complete the course in exactly 24 months. The Wharton School Executive MBA students earn their degree over the course of 24 months with three terms per year. The first year in the program is built around core classes, focusing on: Leadership Essentials; Analytical Foundations; and Core Business Foundations. Each core philosophy contains an array of courses to help build a foundation that is further developed in the second year with electives. Students have the option to select from an extensive array of electives and campus flexibility in case the courses are not provided at the specific location of which they are enrolled in. The number of electives may vary, but the minimum amount of options is usually 25. In the program’s second year, EMBA students engage in a weeklong course abroad in a country that is experiencing relevant economic challenges. A total of 234 students are enrolled in the Wharton Executive MBA Class of 2020. The average age is 35, and the typical duration of work experience is 11 years. The median GMAT score is 700. Around 32 percent of students identify as female, and 12 percent identify as underrepresented minorities. About 51 percent of EMBA students hold advanced degrees and a median salary (including bonuses) of $190,000. Wharton’s Career Management Services (CMS) offers a number of opportunities for students to further prepare them for returning their current employer or to seek out a new one. This includes career coaching, resume writing guidance, and additional one-on-one attention during the latter part of their time at the school. In their second term students are encouraged to fill out a CMS Application Participation Form. This form helps them get paired with CMS directors with whom they work to more specifically map out their long-term career strategy and goals. Tuition for the Wharton School Executive MBA on the Philadelphia and San Francisco campus costs $205,200 in total. Tuition and fees include books, class materials, an iPad, the land package for the Global Business Week during the student’s second year, and room and board for students to study (on class days) at the Steinberg Conference Center or Inn at Penn in Philadelphia, or the Le Meriden Hotel in San Francisco. Also included in first year fees is an initial $2,500 deposit. Most EMBA students receive financial support from their employers. Those pursuing an EMBA with less than eight years of work experience are eligible to apply as Fellows candidates, which requires full tuition coverage by their employer. Wharton School Executive MBA students are eligible for Federal direct and Direct GRAD PLUS loans. International students can avail themselves of Wharton’s partnership with Quorum Federal Credit Union. Private alternative loans, scholarships for domestic and international students, and assistance for armed forces veterans are also available as financing options. EMBA applicants must complete Wharton’s online application. Additional materials for a complete application include two letters of recommendation, three essays (and an optional fourth essay), transcripts from previous higher learning institutions, a GMAT score, a letter of sponsorship from their employer and an interview, which they can schedule before submitting their full application. The application fee for the EMBA program is $180.